Yummy Stuff Goes Here Yummy Stuff Goes Here: Durians R us! Late nite Friday.....beeep ...beep, you got message! A friend had texted me to say that Woolies has durians at $4.98 kg. I was stucked in a hair salon and groaned out loud! Then I lamented to myself that these are frozen durians...."Jackie, not that good.... flown first class... old already.....not that good....you will not missed a thing...."
This is not good! 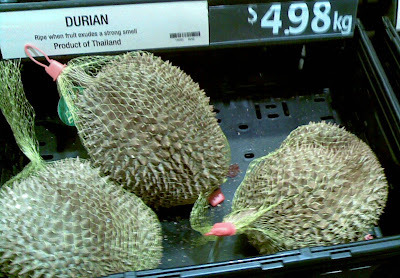 ....I want durians! After a few shakes and sniffs later.....aiya....not so good lah..... shall I buy the big fat plump one? OMG I can smell it! Good Lord! It has cracked open a bit...let see...all yellow, not icy watery, wah...maybe can lah!!! Just buy one, then not so waste! I am so full....still got half a plate...durian very good lah!!!!! Thank you, thank you for aeroplanes and durian farmer and friend who texted me! But I still want to do Penang Durain Tour with my good friend KC. Aiya, why no mangosteen, how to fight heaty food now leh?